The field of dentistry does not just involve the teeth. It also includes the jawbones. Sometimes, these bones need to be modified. For example, in order for dental implants to be successful, the jawbone must have enough bone to support them. 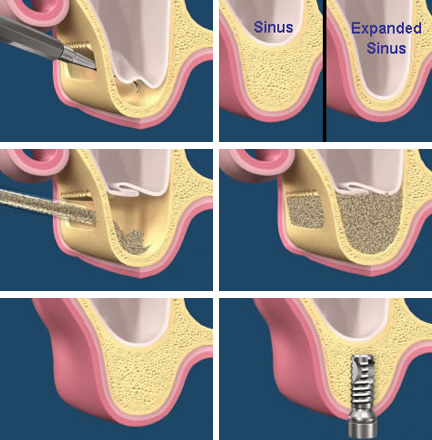 The sinus lift is one of the most predictable types of bone augmentation in dentistry. The sinus lift is also known as sinus augmentation. This method of procedure is required in case the vertical bone height of posterior upper arches is not sufficient for an implant placement. The Posterior upper bone ridges are vertically limited from cavities called “ Sinus Maxillaris.” Nevertheless, the volume of this sinus typically increases and the thickness of the bone decreases(atrophy) after molar tooth extraction due to the deloaded bone. The main difference between the lateral window technique and the transkrestal sinus lift is the access to the sinus cavity which is in the lateral technique from the external site of the ridge, the transcrestal is in the vertical direction from the top part of the ridge, typically in combination with the implant drilling and placement procedure. The transcrestal technique is preferred as it saves time and costs to as the implant can be placed simultaneously with the augmentative procedure. Contraindication against the transcrestal technique and for the lateral window technique are too small vertical bone heights and deeply angulated bone cavities. To allow to place implants, the bone around this area most be thickened. Different techniques are performed such as the lateral window technique and the internal sinus lift procedure. Do inquire from your oral maxillofacial surgeon or dental practitioner whether a bone augmentation surgery is required prior to procedures such as dental implants.